Jonathan Dodd returns with his Sunday column and this week talks about one of his new heroes, Professor John McGeehan, Director of the Institute of Biological and Biomedical Sciences in the School of Biological Sciences at Portsmouth University. Find out why. There are some stories that are timeless and universal, and we tell and retell them down the ages from generation to generation, and we find many new and different interpretations, so they fit the world into which each new generation is going to grow. And then there are stories that are new, and can’t be fitted anywhere in our experience, and which probably aren’t even finished, so we don’t know the ending. Some stories don’t need an ending, and some leave us with alternative endings, and some are unfinished, because the ending is unknown. This is one of those. There’s a mountain in Japan that’s very recent, compared to most mountains, but it has been there for at least a few years. This particular mountain is made entirely of plastic water bottles. An enterprising scientist was wondering what was happening at the bottom of this mountain, where the oldest bottles were lying beneath all that weight. We know that plastic bottles are light, because we use them every day, and they’re familiar to us, although we don’t think much about them, unless it’s a matter of needing a drink of water, and where to dispose of them when they’re empty. But a mountain of bottles will weigh quite a lot. And it’s not going to go away or change much, because the plastic we make these bottles out of doesn’t break down. The curious scientist got permission to burrow down, and discovered that the bottom of the mountain was a seething mass of life, composed of detritus and rainwater, much as expected. But some of the supposedly indestructible plastic bottles were showing signs of unexpected decomposition. This was reported, and became the object of much excitement in the scientific community. It was discovered that there were new microbes that were ‘eating’ the plastic. 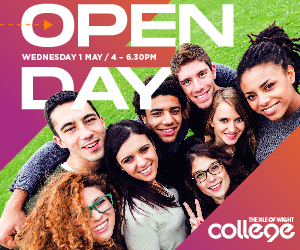 Last week at the Café Scientifique in Shanklin, we were told about this by Professor John McGeehan, Director of the Institute of Biological and Biomedical Sciences in the School of Biological Sciences at Portsmouth University. He was surprisingly youthful, and very enthusiastic about his subject, and explained everything that had developed since to a rapt audience. 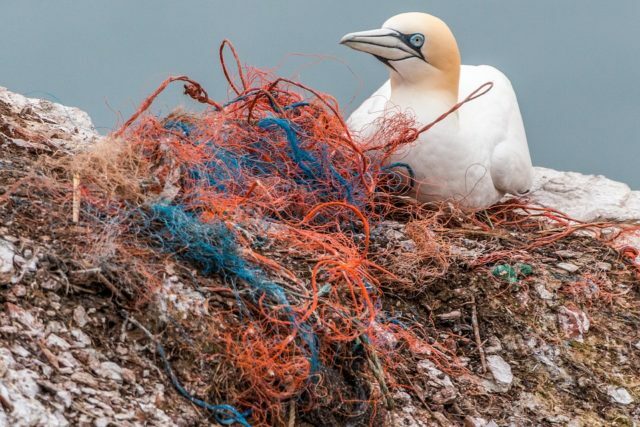 We’ve all seen the pictures of the oceans, covered with a layer of plastic rubbish, and we’re aware of the harm to wildlife that we’re creating, and we know that we’re not dealing with our waste, and we probably feel helpless, because we can’t imagine any possible solution. But there is hope. 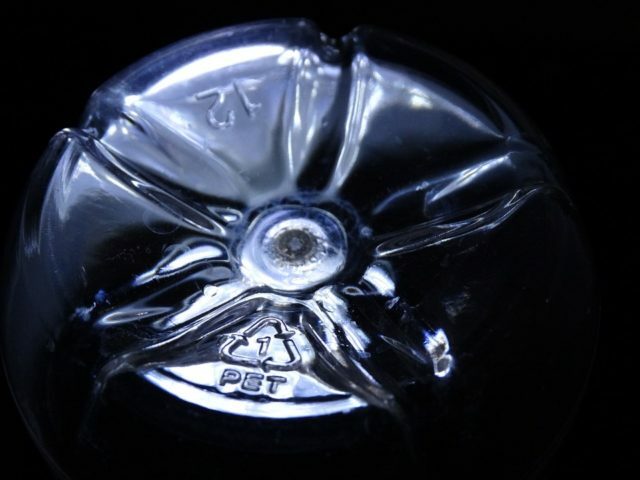 First of all, every water bottle is made of the same stuff – Polyethylene terephthalate, known as PET. This is basically two substances present in crude oil, which are combined into one strong plastic, ideal for making practically anything, which doesn’t biodegrade for at least 400 years. 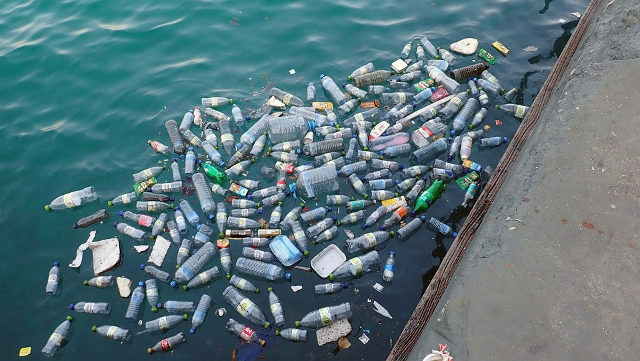 Those are the bottles we see in the oceans, the same that we buy in our shops. Globally, we make 20,000 of these bottles every second. They all have the letters PET inside a triangle of arrows and the number 1 impressed on the bottom, which means they’re supposed to be recyclable. The trouble is that this is not strictly true. If these bottles are collected in large enough quantities, they can be treated and reused, but they’re not as good as they were at first, so they can be made into fibre, for clothing. You’re probably wearing some now. If these clothes wear out and are collected, they can be recycled into an even more degraded form, which is used in making carpets. 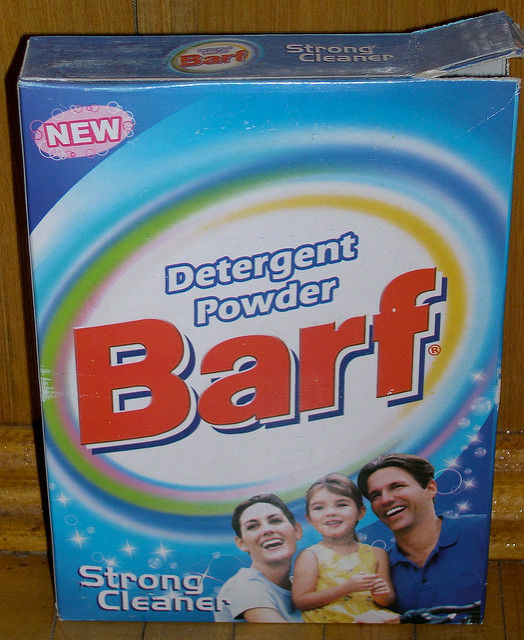 You’ve probably got some of that in your house. When your carpets wear out, they’re not much good for anything, and they get thrown in landfill. So the recycling only accounts for a proportion of the bottles and other items that we use, and it’s always going to end up in landfill somewhere. Recycling in this case just means some of it will be reused for other purposes, for a while. 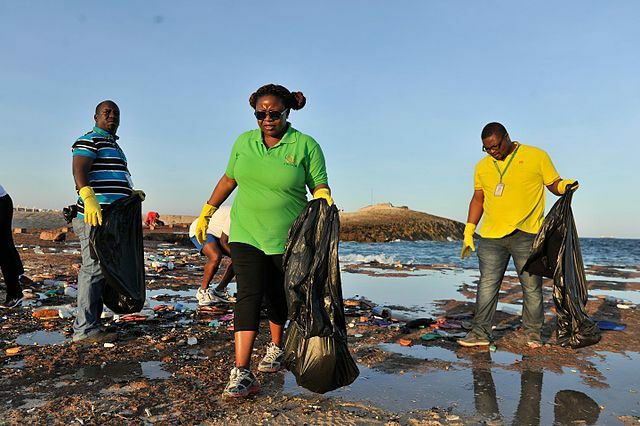 A lot of people are very lax about recycling their waste, and some countries have absolutely no recycling facilities. 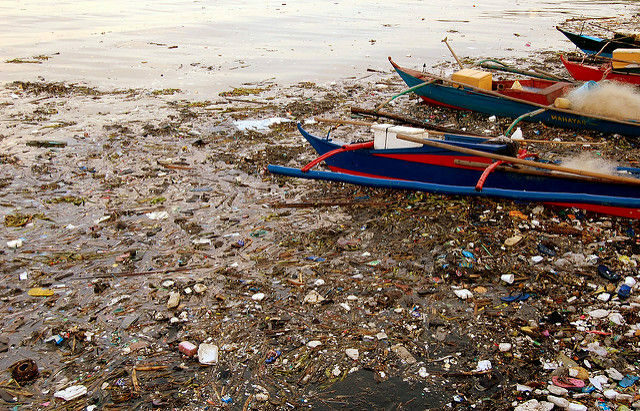 Indonesia is a prime example of this, and its rivers are all entirely clogged with rubbish, and they’re creating an ecological disaster. All the plastic that flows into the oceans follows the currents and collects in great floating masses where the currents leave them. And a lot of them get washed up on every beach in the world, more and more all the time. Our use of these plastics increases exponentially every year. PET is only one plastic that we use. There are many more. Some biodegrade faster than others, but we have a problem with this process as well. What we want is to be able to collect all of it and use it in a way that doesn’t leave stuff around that wasn’t there before, and this isn’t happening. Companies can be very clever in their use of words, to make us feel that they’re using it carefully and that it’ll all go away, but this isn’t so. What they mean is that the plastic gets worn away into increasingly small bits, and eventually these bits are too small to see. They get eaten up by fish, and they enter our food, and we eat them too. So you have some of that plastic inside you too, right now. We don’t know what this might end up doing to us, and I’m not sure that we would like to think about this either. I love sea glass. Take a walk along any beach, and you can see small bright pieces of glass shining in the sun. 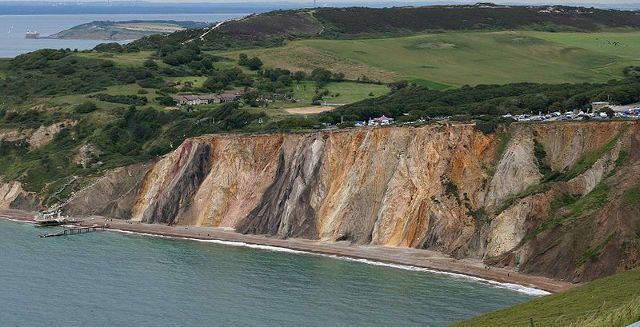 They were once pieces of bottles, smashed and rolled around with the pebbles, getting chipped away and polished until they eventually join the dust and mud and sand, and end up on the seabed, presumably, to emerge in several million year as part of some cliff, like at Alum Bay. I’m assuming that there’s no plastic in the Alum Bay cliffs, but the glass we’ve dropped into the sea will end up somewhere a long time from now in some cliff. And so will the plastic. And there’s a lot more of that than there is of glass. If we managed to collect all of our plastic, we could reuse it a few times, but the process we use degrades it and uses a lot of energy. This is where Professor McGeehan enters the picture. He was very excited about what was happening inside the Japanese bottle mountain. He discovered that a certain type of microbe had accidentally created an enzyme inside itself that could take a molecule of PET and chop it in two, freeing up the constituent parts and making them available to eat. These microbes didn’t do this on purpose. In a purely Darwinian process, in a population of incalculable numbers, mistakes appear in every generation, most of which don’t work, but occasionally they work rather well. Genetic changes that work well cause a population to grow fast, because they’re able to eat more. The problem with these microbes is that they are able to turn the bottles into food, but they work rather slowly. A bottle that used to biodegrade, or maybe just get rubbed into tiny bits in 400 years, could now take only 20 years to be eaten up. That’s not fast enough for our purposes. So Prof McGeehan and his collaborators started studying the microbes, and discovered the enzyme that was chopping the plastic molecules up, and they tweaked the genetics slightly, and it turned out that they got much faster results than they expected. They’re hoping to make a version that’s faster still. They also found out the chemical composition of the enzyme and were able to manufacture it. Rather like the enzymes in our washing powder, that decompose grass stains, or tomato juice in our clothes during our washing cycles. This would dispense with the need for messy microbes, and allows a certain amount of control. The theory is that if we can collect all our plastic that’s been used and thrown away, we can place it in a large container and throw in a quantity of this enzyme, which will break down all the PET plastic, so that its constituent parts can be collected and recombined as brand-new PET plastic, and used for making into more bottles. The enzyme can also be collected and reused, because it doesn’t get used up. But the problem with this is that we need a mechanism for stopping the PET from clogging up the oceans. One solution would be to make us pay for our bottles and get refunds from the shops. Another would be to add PET reprocessing plants to every rubbish-collection plant. But it seems that every county in every country that does this has a different way of doing it. Many companies have invested huge amounts in the old energy-heavy PET processing, and they don’t want to bankrupt themselves by having to switch before they’ve paid for the last lot of expensive building work. They have a point, but a way would need to be found to make this work. Assuming we could collect all our plastic and grab it back, we would be less dependent on oil out of the ground, especially now it’s running out. 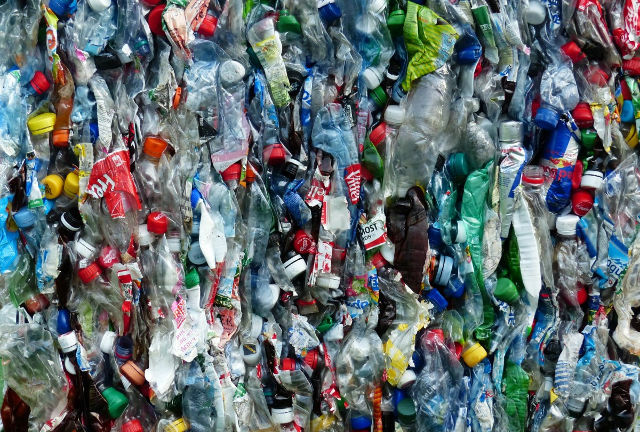 We’d be able to reuse our plastic endlessly, because the enzyme has no effect on the substances apart from separating them back to the way they were before they were combined originally. We would also stop throwing plastic into the oceans. But we would still be left with the biggest clean-up in human history, and a legacy of rubbish in the environment. Because the enzyme isn’t alive, it’s not possible or maybe not safe to release into the environment in huge amounts, and although we might be able to genetically alter some microbe and release that, so it spreads everywhere and sorts out all the plastic, but we wouldn’t know what other effects that might have on the world. Everything I’ve written here, from my faulty memory of what Prof McGeehan said on Monday just relates to PET plastic. I apologise for anything I mis-remembered. Please correct any mistakes you find here. It might be possible to find other enzymes for other plastics, but that would rely on a lot of money being spent, and co-ordinated collaboration by scientists across many borders, for many years. I think it’s worth it. But we’re about to lose all our collaborative agencies and ventures because we’re leaving the EU, and various countries like the USA are in the grip of regimes that deny the science behind this, and many countries simply don’t have the will or the resources to start cleaning up their acts. Our future has always been uncertain, and we need to start making it less uncertain rather than more so, before the problems we’re making for ourselves become insuperable. Prof McGeehan has become a new hero of mine, with his modesty and enthusiasm and his desire to turn around the damage we have done, and I would like to think that he’ll be given every bit of help in his efforts to make the world safer and cleaner, and to encourage us to think through what we’re doing before we do it. I think it’s a no-brainer. 1 Comment on "Jonathan Dodd: The Mountain and the Microbe"
Thanks again Jonathan; well worth a wider audience.